2 Are Weight Gainers For You? 5 Can’t Find a Weight Gainer That Meets Your Needs? Weight gainers, not so long ago, were basically sugar and fat combined to make up impressive calorie amounts that moved them off the shelves. Unfortunately, for many of us who knew no better, they moved from the shelves to our stomachs where they formed inner tubes of fat. Not a pretty sight. As is true with most bodybuilding supplements, as knowledge and understanding of athletic dietary requirements have increased, nutrition companies have produced some very effective weight gainers (but the old kind, the sugar and fat, still lurk, so read your labels). Weight gainers are essentially meal replacements with higher calorie amounts. Like meal replacements, it is relatively easy in today’s market to find those that have good quality protein, carbs and acceptable fat content. Today’s most popular weight gainers are powders that when mixed with about 16 oz. of water give you about 600-900 calories per serving. There is much more to gaining lean muscle than just assaulting the body with massive amounts of calories. You must have quality protein, carbohydrate and fat content in addition to vitamins and minerals and you must supply the body with these nutrients in the most advantageous ways. Weight gainers do not contain a magic weight gain formula. They are just calories. Slim-Fast shakes are popular weight loss diet drinks while Optimum Nutrition’s Serious Mass is a popular weight gainer drink. They are, obviously, marketed at completely opposite fitness pursuits. It may, however, surprise you just how much these products have in common. Looking at the above, you see fairly comparable products. The difference between Slim-Fast and Serious Mass? It basically comes down to recommended serving size and marketing. Combine a few Slim-Fast’s and you have a product that could be marketed as a weight gainer. Likewise, cut the serving size of Serious Mass and you have an MRP. Cut it a little more and you have a weight loss MRP. The take-home lesson: It is all about calories. Your total calorie intake decides whether or not you gain or lose weight. Products directed at these goals are based on the calories they provide, not magic formulas. Keep your focus on your total daily caloric intake. This is where your success or failure is determined. It isn’t determined by what products you are taking to help you get there. Are Weight Gainers For You? Despite the fact that you may consider yourself to be in desperate need to gain weight fast, often times weight gainers are not the way to go. It may seem logical by the very nature of their name that they are the bodybuilding supplements to start with for such a person, but this is not necessarily the case. The key to deciding if they are for you is to develop a weight gain diet plan. When you have a weight gain diet plan in place, the decision on whether or not to add weight gainers or meal replacements becomes easy as you determine your ability to CONSISTENTLY consume the calories and nutrients called for in your plan. If you can get all the nutrition you need from whole food that is the way to go. For many, however, this is not a realistic possibility. This is where weight gainers and meal replacements can really help – they can provide quick and nutritious meals. 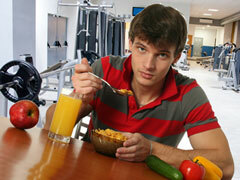 Another way to effectively use weight gainers is in your post-workout meal. A quality weight gainer can provide very desirable post workout nutrition by quickly providing the body with a good carb and protein mixture. The best weight gainer for you is the one that best helps you meet your daily caloric goals. If you need more protein, seek a weight gainer heavy on protein. If you are meeting your protein intake goals but having trouble getting to your total daily calorie goal, a product with lower protein content and higher complex carb content may work better for you. Don’t be wooed by the large calorie content claims of some weight gainers. Remember, you want to divide your daily caloric intake as evenly as possible over many smaller meals. An understanding that these nutrients are most effective when supplied to the body in smaller, steady amounts (6 smaller meals a day as opposed to three big ones) shows the nonsense of the huge calorie per serving claims of some weight gainers. “2,500 Calories!! !” may impress the inexperienced and move some product off the shelves but it shouldn’t be appealing to those taking a rational approach to weight gain. In order for this product to be of value to you in the suggested serving size, you would have a diet plan calling for 15,000 daily calories (6 meals x 2,500 calories). Not likely. Keep in mind, though, that you can always adjust the serving sizes to suit your needs. The way some weight gainers get to those huge calorie claims is through high sugar content. Sugar won’t help you build muscle. It will increase your body-fat levels. Don’t buy a weight gainer for sugar calories. It would be cheaper to go buy a bag of sugar and have at it. Expect to pay more for weight gainers offering quality nutrition and expect to get more muscle for providing your body with that quality nutrition. Can’t Find a Weight Gainer That Meets Your Needs? Check out the Meal Replacements (MRPs). Remember, these are essentially the same products just marketed differently. Heck, you could raid the fridge and start downing your wife’s weight loss shakes if you got desperate. Again, it is total caloric intake you are after.